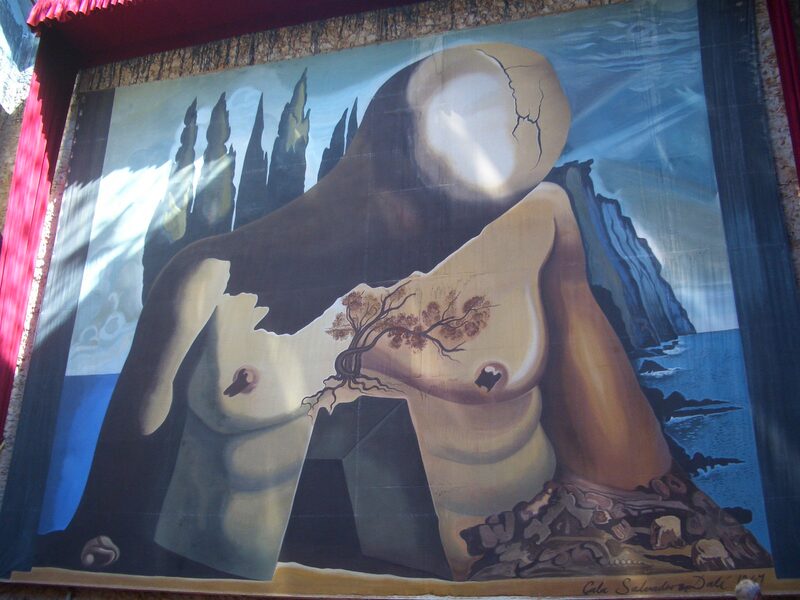 I’ve been back from Spain for a while now so, if anybody was wondering, I didn’t drown on the log flume, decide to run away with the circus or take up residence in Salvador Dali’s amazing museum in Figueres (though that was tempting) but have been overtaken by events, one of which was trying to finish my outfit for the OAL (or outfit along). Despite me being blasé at the beginning as I thought there would be plenty of time to make a dress and a cardigan in the time given, I have only today been ready to take photographs and it is the final day. Eeek! Is that the time? Why do I keep making everything too big for me lately? This cardigan is supposed to have ‘negative ease’. Perhaps it’s also too heavy and that’s why I appear to be toppling over. Maybe I’ll just wear it open. The dress could be cinched in a few inches all over. Despite appearing to have that condition where you have a distorted image of yourself – is it dysmorphia? (I know I could Google it but I’m in the middle of a blog post), I do like the dress and, next time, will make the smaller size. I have altered the shoulders as much as I could as they were falling off but it would have been so much easier before it was all constructed. Duh! 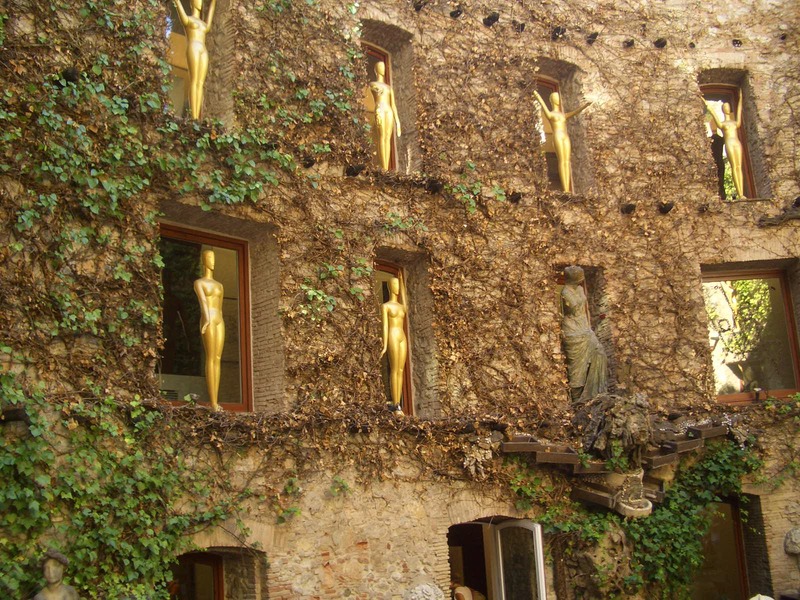 Anyway, I won’t bore you with construction details as I’ll probably do that over on my Ravelry thread and I need to go and feed the dogs (and my daughter) but here’s a glimpse of why I wanted to live in Salvador Dali’s house. More mannequins than even I have …..
and something to contemplate on a dull evening. Sorry for the rushed post but I had to meet the deadline for the OAL . Off to eat loads of dinner so I can fit into my new outfit. Warning: Sensitive cyclists do not read on. Disclaimer: Some of my best friends are cyclists. True. 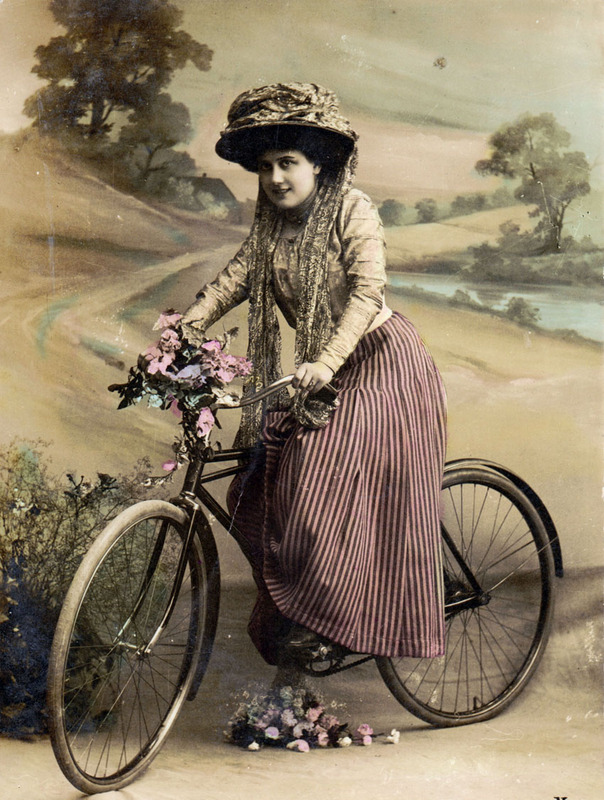 One such madwoman friend is cycling from Paris to where I live in the South of France which is almost 800 km – a distance I consider fit only for an aircraft. They love cycling in France and it appears to take priority over other traffic be it pedestrian, car or ambulance. 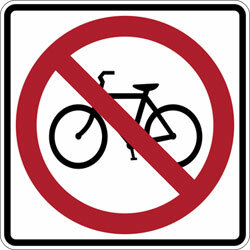 I don’t love cycling. I’m not talking about cycling down to the bakery to get your croissants or zipping round to see your friend on the other side of town or gently trundling along taking in some beautiful scenery. I’m talking about vast armies of cyclists, five or six abreast, steaming down country roads, grimly determined and in my way. I don’t like the hideous lycra they wear or the way they hog more than one lane. I can’t understand the attraction of standing by the side of the road watching streams of bikes going by in a blur or parking your vehicle on a bend to watch so that cars can’t get past you for 10 minutes in case they knock over one of the oncoming cyclists. If it had been suggested, some years ago, that men (as they mostly seem to be) put on skin tight body stockings and wore them in public the idea would have been laughed out of town. It is particularly unappealing when they stop by the side of the road and, without bothering to conceal themselves in the trees, face the oncoming traffic that is already being forced to go at a snail’s pace and take a pee – although that is something observed regularly here in France even when there is not a bike race going on or lycra to contend with. I can barely wait for the Tour de France next month. They made me late for my yoga class this morning but I’m not bitter. Anyway, rant over (until the next time) and here is a sneak peak of my dress for the Outfit Along which, to be honest, I haven’t really been ‘alonging’ with but I’ve made it and it will be photographed and entered. 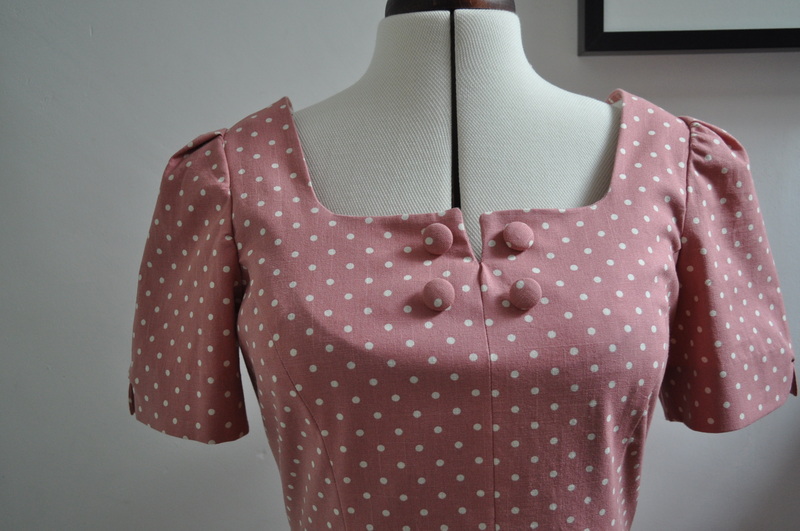 I have recently learnt – too recently for this dress – that you should make the size of dress or top for your upper bust measurement, not your full bust because that will make the shoulders and neckline too big for you, and then you do a full bust adjustment. Oops! So that’s where I’ve been going wrong. My last couple of dresses that have had fitted bodices have indeed been too big on the shoulders. Next time…….. The cardigan part of the outfit has also had its problems. I didn’t like the way I had picked up the stitches for the sleeves so I have frogged both of them and then I realised that I had cast off the stitches of the body too tightly and there was no way that ribbing was going to stretch round my waist. So I, very carefully and with much trepidation, undid the cast off and redid it using Jenys Stretchy Bind Off. Now it will! Just got to do those sleeves again now. 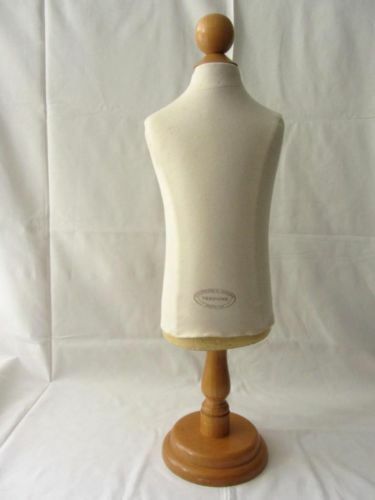 Despite sharing my life with quite a few vintage French mannequins, one of which I sent off to Canada a couple of weeks ago in a box big enough for a coffin, I decided I needed an adjustable mannequin to help me in my dressmaking endeavours. My friend had a Lady Valet and I thought it looked good as well as being useful so I treated myself. 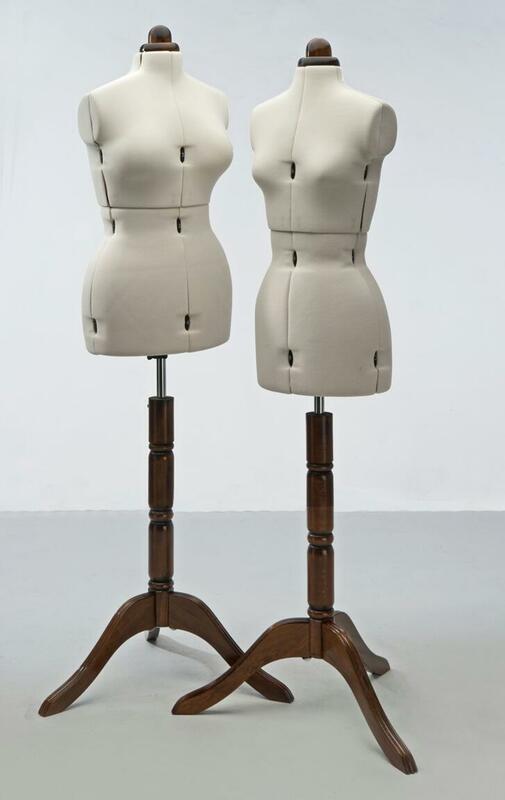 However, I had to buy the small size (the one on the right) for all my measurements including the chest but, though I don’t like to brag, that girl has got nothing on me in the bust department. So, what to do? I googled it, as I do most things I don’t know about, and found that you must not only adjust a dress form to your measurements but pad it a bit to make it feel more like flesh and, if need be, put one of your bras on it and pad to the desired fullness. Then you must cover the whole thing in a body stocking of sorts – should have nabbed one of those cyclists this morning – or use, as I did, a sort of body shaping slip that I sometimes wear if I have a very fitted dress and don’t want lines of underwear showing. So now, instead of my beautiful, clean looking mannequin on her lovely wooden stand, I have this. Note the chest cracked open as if for heart surgery as I struggled to make a doppelganger of myself. I must neither gain nor lose weight as I don’t want to go through that process again and my plans for noting down the measurements of the Tialys madamoiselles and altering the dress form to suit when I’m making something for them will also not be implemented any time soon. Well, guess what, it’s too big. So now, having got the idea in my head, I’ve had to find another, smaller one. 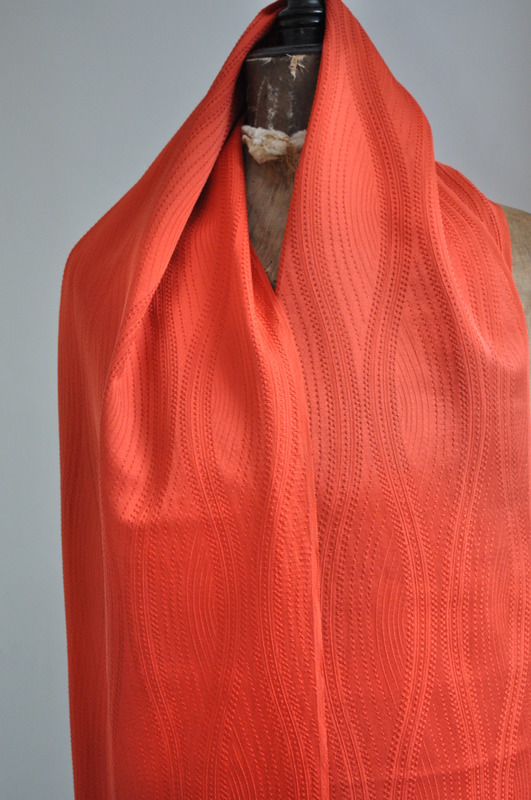 No matter, this one can go in my shop – it’s from Paris dontchaknow. Unfortunately, despite these tiny ones giving me the creeps and being grateful it had no face the one winging its way to me as we speak actually does have a head. Plus, and I don’t know whether this makes matters better or worse, you can remove it. I feel a nightmare coming on. I am no longer ‘waiting for the wadding’ as mentioned in my last post. It is sandwiched between the front and back layers of my quilt and basted with curvy safety pins. 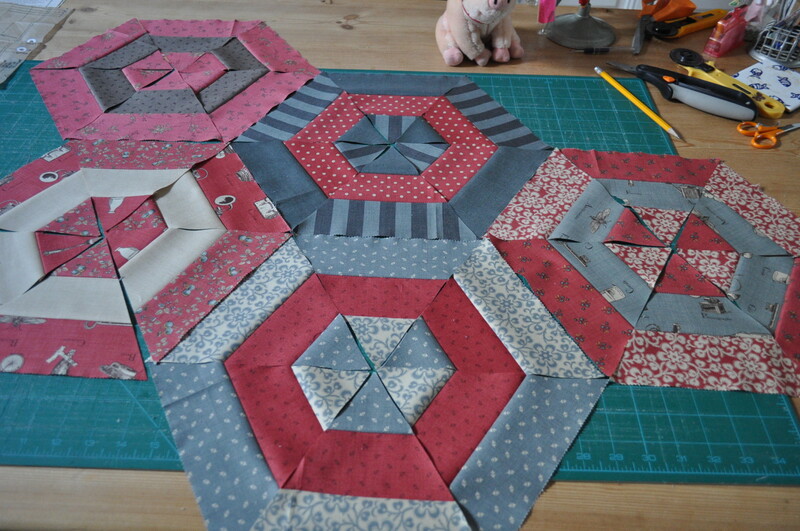 Off to start quilting it as it’s taking up my workroom floor and I won’t be able to get anything else done until it is at least de-masking taped from the floorboards. 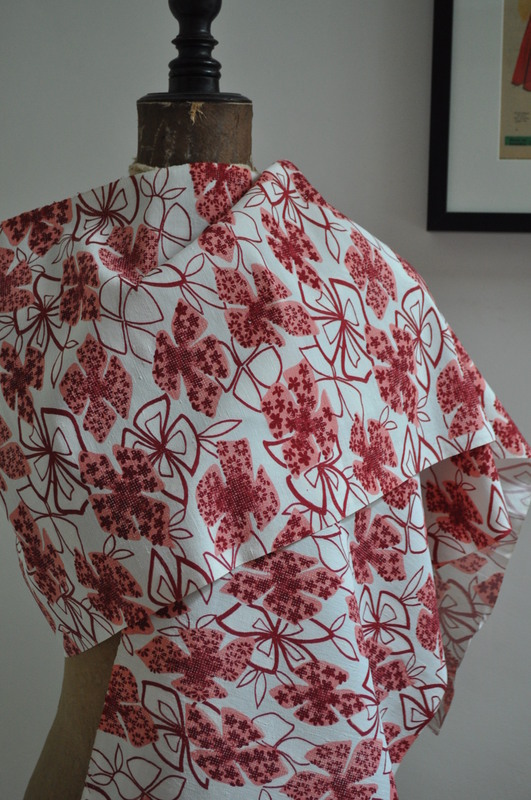 I have a friend, in France, who loves all things Japanese and goes there quite often and has ‘contacts’ and returns with beautiful vintage kimono and fabulous fabrics. 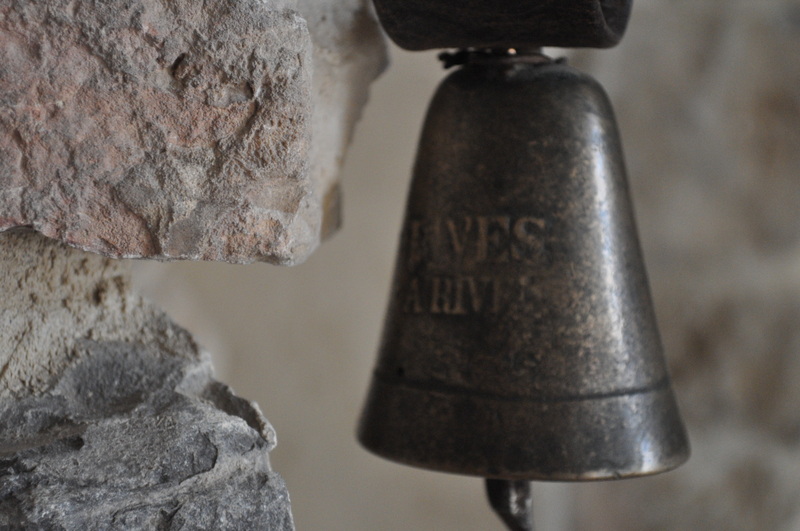 She took a fancy to an old livestock bell I had in my vintage shop because it was made in the village where she lives. She wanted to know if I would do a swap. 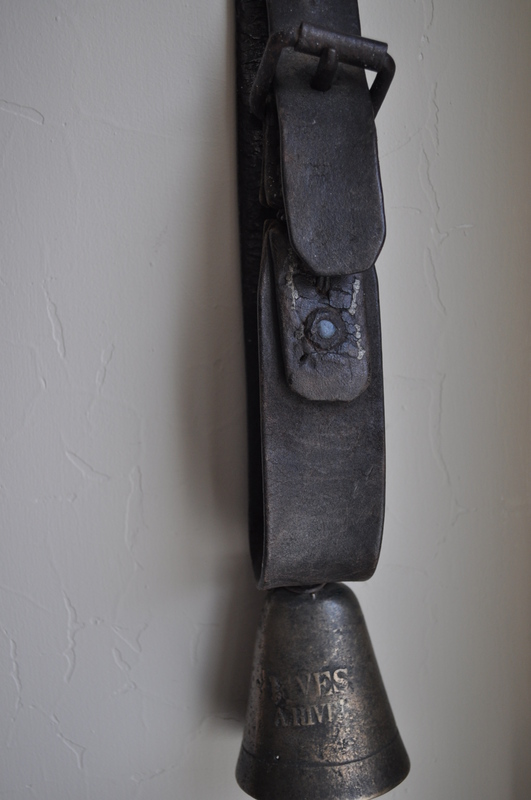 The animal bell for some Japanese fabric. So I went round to her house and had a rummage and this is what I ended up with. Apparently the wavy lines are picking out the movement of water flowing in a river. Traditionally, this motif symbolizes the passage of time, and the course of a lifetime. 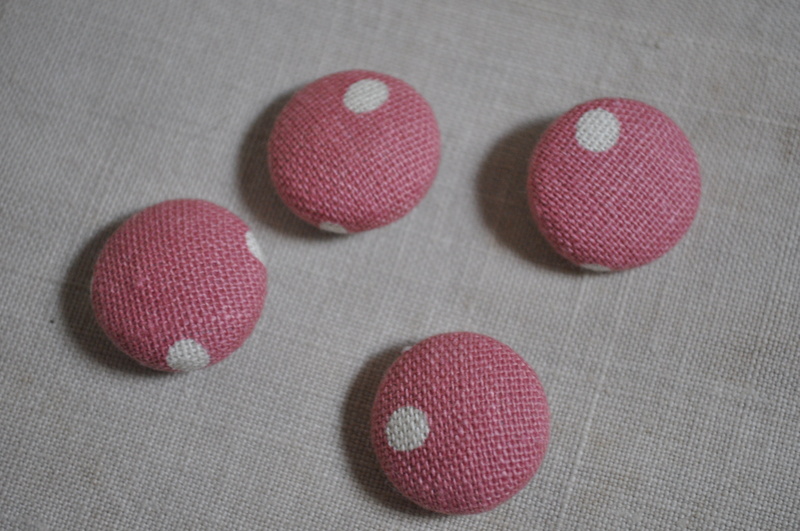 Well, there you go – I just liked the colour and the ‘bobbly’ bits. and these two indigo cottons which I am going to fuse together somehow for an infant’s outfit. 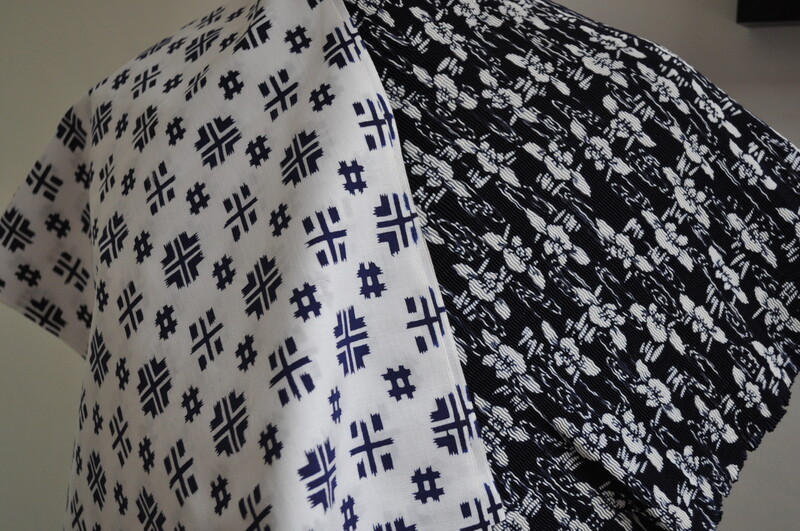 The dark blue one is sort of ‘corrugated’ – if you know what I mean – so I think it might look like shirring and would make a cute top to a summer dress with the other fabric as the skirt. Now my dilemma is, what can I do with beautiful fabric that is only about 14 inches wide? I’ve got around 2.5 meters of the orange and 2m of the pink and I’m thinking of some sort of tops but I think they would have to be in panels. Any suggestions? Is it possible to make anything other than a scarf? 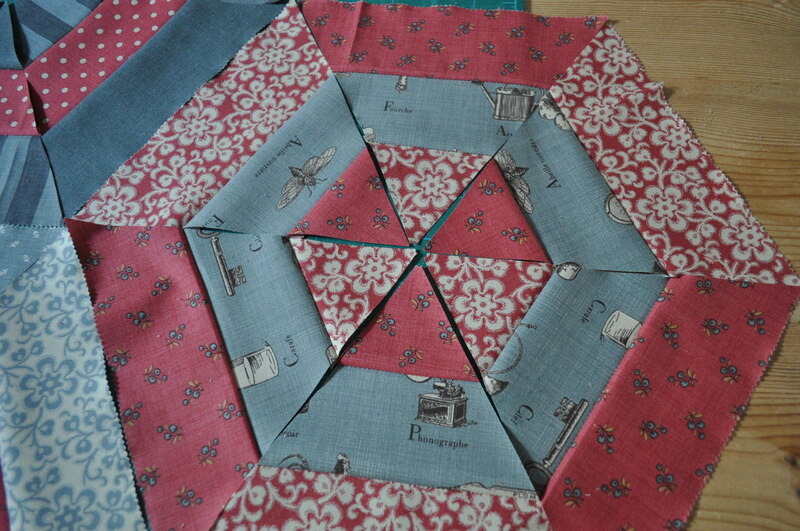 The indigo prints are easier – I think I will be able to make a really cute baby dress from those. I haven’t been promoting my baby dresses because I haven’t been pleased with the photographs. I don’t have a baby to model the clothes and my dogs wriggle too much and struggle with the bloomers 😉 So, not having enough vintage mannequins in my house already(! ), I found a child-sized mannequin on Ebay which used to grace a shop in Paris and plan to take a whole new set of photographs using this display model. Is it me or is this just a tiny bit creepy? Thank goodness it hasn’t got a face. 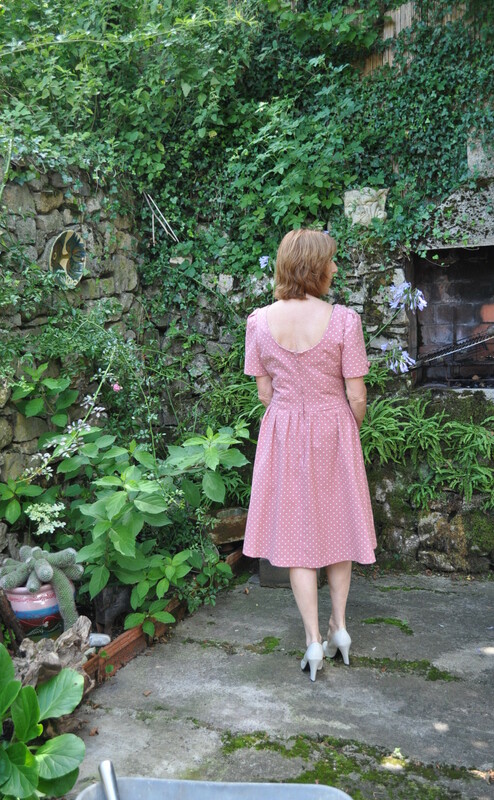 In other breathtaking news – I have finished my Simplicity 1803 dress for the Outfit Along – just need to hem it – and will reveal it soon. 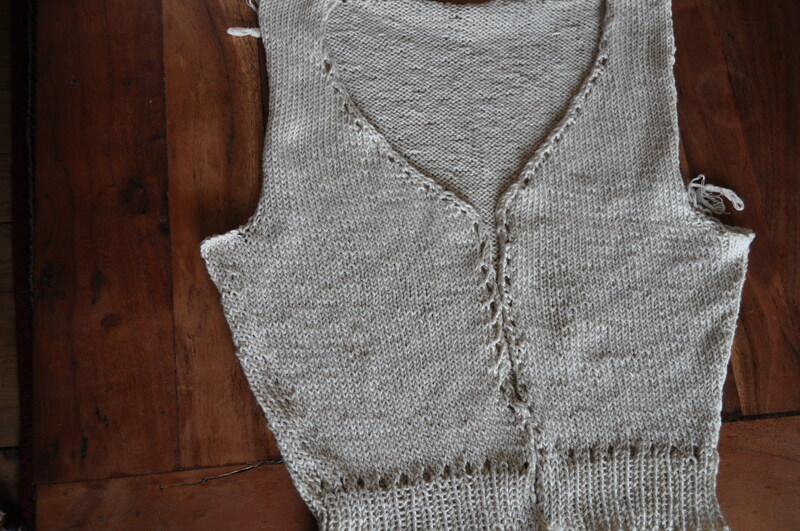 The other part of the Outfit Along – the Myrna Cardigan – is one-armed at the moment but I hope to have it completed by the middle (or end) of next week. I am pleased with the dress but the cardigan will probably end up as another ’round the house’ knit. We’ll see. I might try the method of using petersham ribbon behind the button and buttonhole bands for a neater and stronger finish as there is quite a bit of negative ease in this cardigan (hark at me getting all technical!) and it might look as if it is pulling a bit across the girls otherwise. A tutorial for such a method is outlined here and I will report back if I decide to go along with it. I am girding my loins to attend a vide grenier (boot sale, yard sale, flea market) as a seller rather than a buyer this Sunday. Mlle. 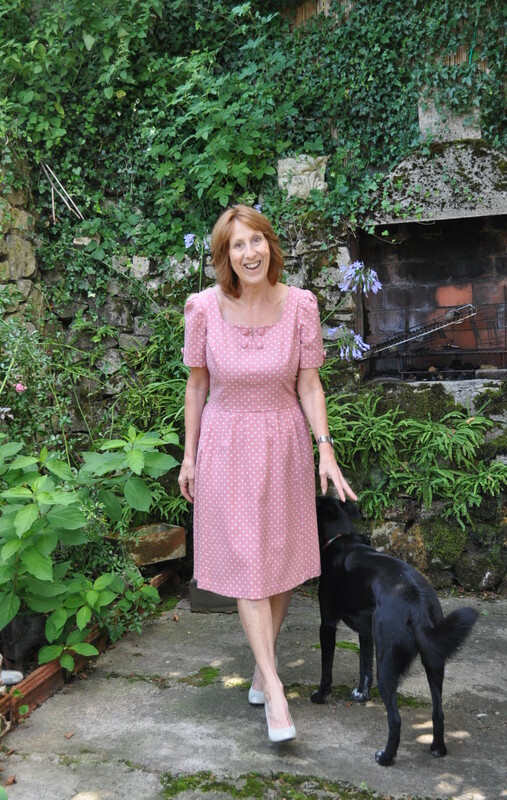 Tialys the elder and myself will be attempting to sell some of the results of an over enthusiastic clothes buying habit formed over the last 5 years in her case and many more years in mine – and making room in our wardrobes for our new passion for lovingly hand made clothing. I’ll let you know how we get on but be prepared for some grumbling about that group of people known as ‘the public’ which we will be miraculously disassociated from on Sunday as we attempt to sell to them. Example scenario ” a euro for a vintage leather handbag – are you mad? – I’ll give you 50 cents” . Maybe it will rain……. I just finished another Coco dress. 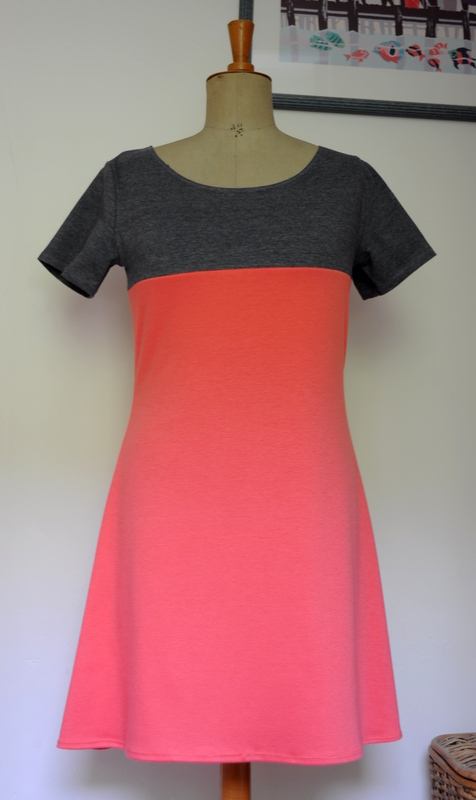 I bought this coral coloured jersey which was the perfect weight for this dress but I felt was a little bright to make the whole dress in. So I decided to pair it with this grey jersey and have a go at making a colour block version. I love it but, unfortunately, forgot to lengthen it this time so I will get a consensus of opinion from family and blunt honest friends and, if they think it’s too short for me, I’ll have to hand it over to one of the Madamoiselles. I think you can usually get away with things a little shorter in the summer with bare legs and flats but we’ll see. Only a couple of days to go until the Lladybird and Tangled Threads’ Outfit Along starts so I wanted to finish up some projects I had on the go and start with a clean (ish) slate. As I explained here this Outfit Along comprises a dress (or skirt) and a cardigan to go with it. 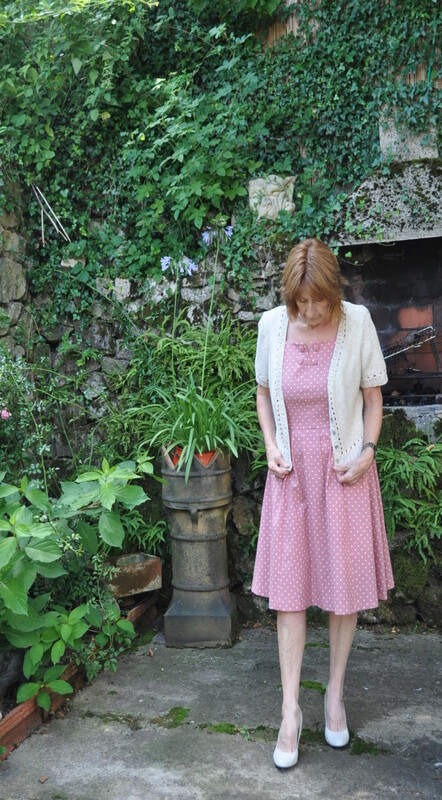 The suggested pattern for the dress is Simplicity 1803 which I already have and had bought the fabric for some time ago and the cardigan is the new one from Andi Satterlund called Myrna. 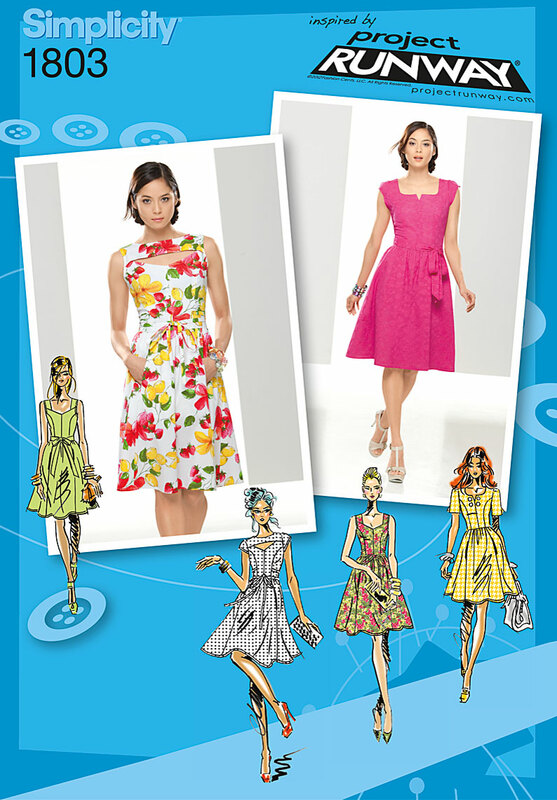 I’m going to make the one in the bottom right hand corner with the short sleeves and button embellishments. 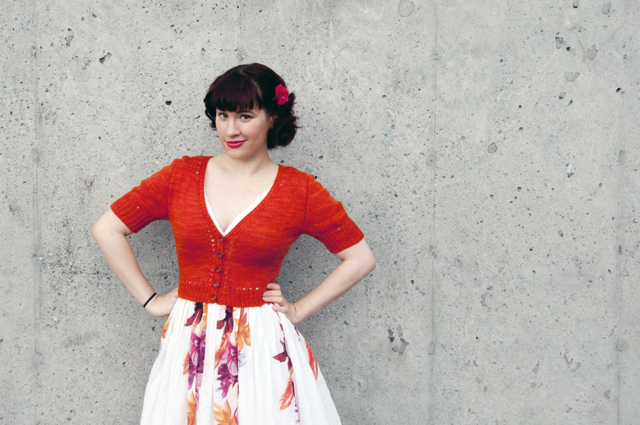 Here’s the cardi I’m going to make. There are lots of gorgeous fabric and yarn choices going on and I’ve been watching the Ravelry thread to see what people are choosing. However, much as I like the bright, patterned fabrics, I’m taking into consideration my lifestyle, location, age, wearing opportunities and going with something a bit more ‘sensible’ or let’s use the word ‘classic’ as it sounds slightly less boring. So, these are my fabric and yarn choices. What do you think? Be quick and tell me if you don’t think they’d work as I start the day after tomorrow! I’m sure I will have time to do plenty of other things at the the same time – we have until the end of July after all – and the dress shouldn’t take me long but I only knit in the evenings so the cardigan is likely to be the thing in danger of not being finished so no more knitting projects until afterward. 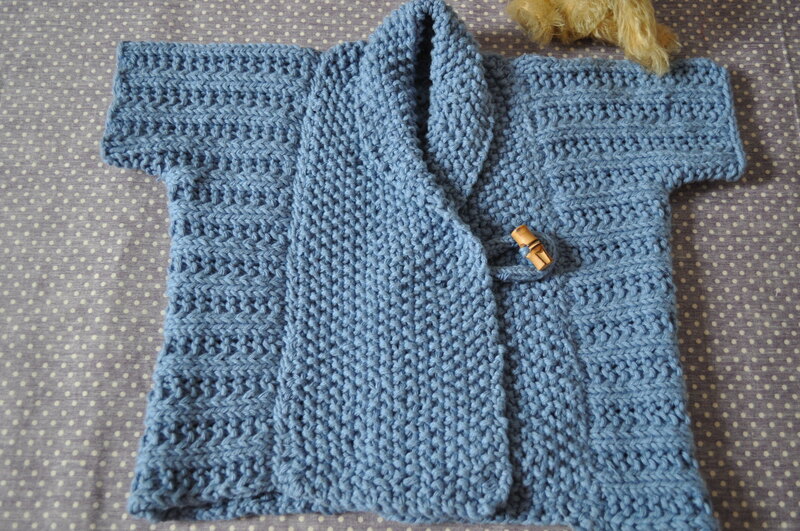 I just had time to finish off this cute baby jacket which will, eventually, be in my shop as I have lots of plans for more hand knit baby wear but I’ve got to complete a few more yet before I put them in the shop. I’m frantically sewing up a knitted jacket for myself – don’t you just hate the sewing up part of knitting? – then that will be out of the way and I can cut out and cast on. 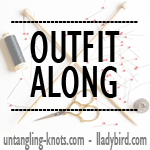 I mostly think of sewing and knitting as a lone pursuit – although I find knitting a bit more sociable as it tends to be more portable and I don’t have to disappear upstairs where my sewing machine lives. When I was still in the U.K. I used to go, every couple of weeks, to a local craft shop who gave over a table cunningly placed in the centre of the fabric section, to a group of us who would sew together, mostly patchwork quilting projects, in exchange for the vast quantities of fabric we would buy. I did try joining a group here but found the projects they did a little uninspired and they didn’t seem willing to try out new things. Three of us rebelled and started a breakaway group which, although it is now down to two, suits me fine and is a little more centred on dressmaking which is also good as that is my ‘thing’ at the moment. I do like talking about sewing and knitting projects but my weekly sewing buddy is French and, although my Franglais isn’t too bad, it’s just not the same as chatting in your native language. As most of my other ‘real life’ friends aren’t interested in the ins and outs of it – to say nothing of the lack of interest at home(!) – I have turned to ‘virtual’ friends in blogland to share these interests and to find inspiration. I have never done a sew along or knit along online because I haven’t liked the patterns chosen or have missed the beginning or just never got round to it. Also, I usually like working at my own pace. However, I found myself tempted by this one which is an outfit along, a joint venture by Lauren, sewing diva at Lladybird and Andi Satterlund, knitwear designer at Untangling Knots, this will start on 1st June and the finished outfits to be photographed and submitted on the Ravelry thread by the end of July. The idea is to have a finished outfit at the end of two months and this includes a dress and a short cardigan to wear over the top of it. 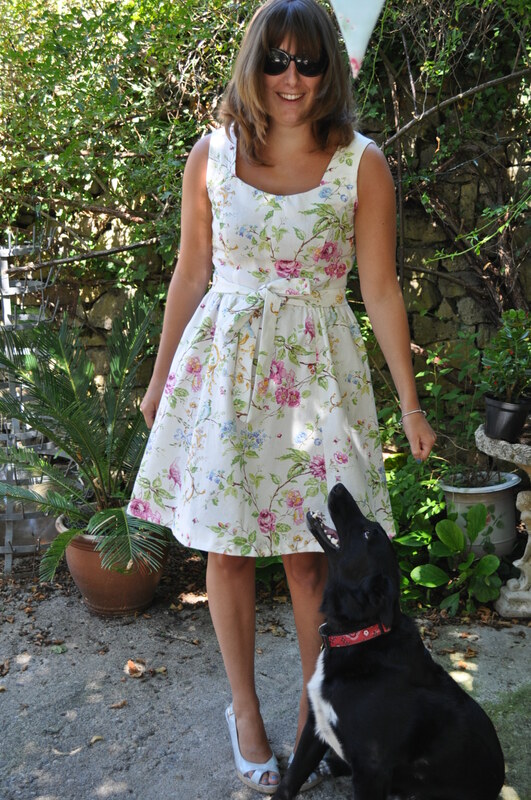 As luck would have it, the dress pattern suggested, Simplicity 1803, is one that I have already and have even bought the fabric for. Mlle. Tialys the elder has already made one for herself and it looks great on her, I’ve just never got around to making my version. 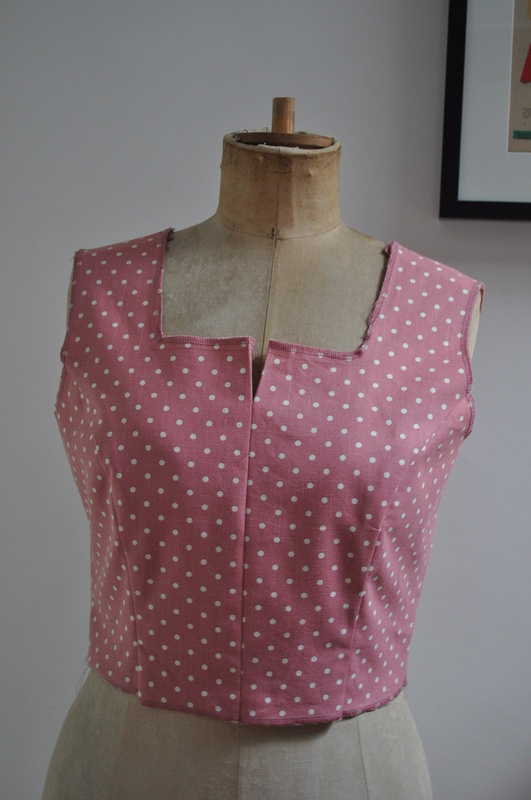 I am going to make the version with short sleeves and a slotted neckline in a spotty fabric. The cardigan is a new design by Andi Satterlund called Myrna which I have bought, downloaded and ordered the yarn for so, once that arrives, I’m all ready to go. I might miss out the keyhole detail on the back though as I’m not convinced it wouldn’t look like I’d just ripped a hole in it on some brambles or something. Apart from that, I love the short sleeves, v-neck and eyelet details and I’m going to make it in a short of linen colour. I have made one of Andi’s patterns before, the Miette (shown in my post here), another top down cardigan, which was something I’d never attempted before so it was interesting to do and knits up quickly. You don’t have to do either of these patterns for the Outfit Along – you could choose different dress and top patterns – but these will be the ones featured on Lauren and Andi’s blogs so, if you need any help, these would be the ones to go for. I love them both and already have the dress pattern so an easy decision for me. I don’t really need help with either pattern (I hope!) but I thought it would give me the push I need to finally get that dress made and, more importantly, I can feel as if I’m part of a sewing/knitting community where I can discuss any problems or little triumphs without getting the glazed look in the eyes of a less interested audience – or at least I won’t be able to see it. Have you ever participated in a knit along or sew along before? If you are a beginner, would you consider it to get you started? 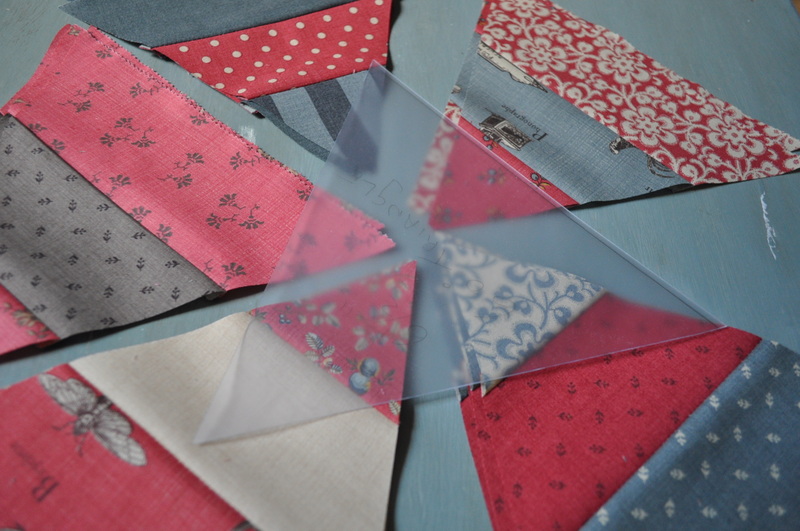 If you are experienced, would you go for it for the same reasons as me or have you got lots of ‘real life’ sewing friends you can bore to death chat to about your projects. You will be pleased to know I have not found any stray dogs in the last couple of weeks – although my neighbour found a lost (and very thin!) hunting dog this morning which, of course, everybody denies all knowledge of. I hate the hunting season – and yes, it has already started again – because, as well as not being particularly enamoured of hunting with dogs for sport, I can’t bear to see the dogs who are often treated abysmally and sometimes get left roaming about for days in danger of being in an accident (or causing one) or loitering around with the bell round their collars ringing through the night and keeping us all awake whilst driving our own dogs mad. Rant over – no more shaggy dog stories – this was supposed to be a ‘girly’ post. My latest vintage passion is these gorgeous old French fashion magazines, Le Petit Echo de la Mode, which were produced from 1879 until 1983. I have started amassing some as and when I come across them but my favourites are the ones from the 1920s and 30s. Having said that, I love the 1940s ones too which came in a smaller format because of the paper shortage during the war years. Look at those gorgeous coats – and those waists! – and I love the Eiffel Tower in the background. 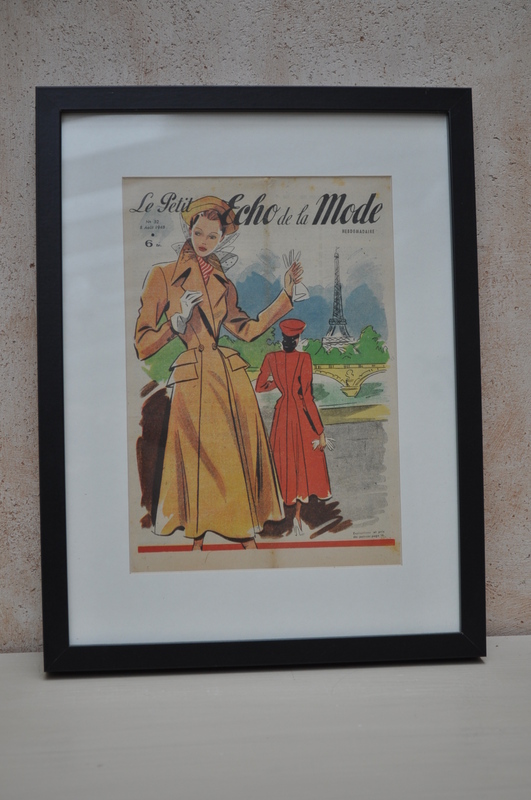 I do put these in my shop from time to time but I am going to frame up a couple of the smaller ones and some of the Art Deco period ones for my own home. They fit so conveniently into the Ikea Ribba frames and the black version complements the header really well. I might go with some sort of theme when choosing which issues to frame such as those featuring dogs – why aren’t you surprised? I have now finished the little fabric tote bag from the French craft magazine I showed you a few weeks ago and I am quite pleased with it. I made the matching coin purse too which is a fat and squidgy shape and looks as if it is full of money but isn’t, unfortunately. 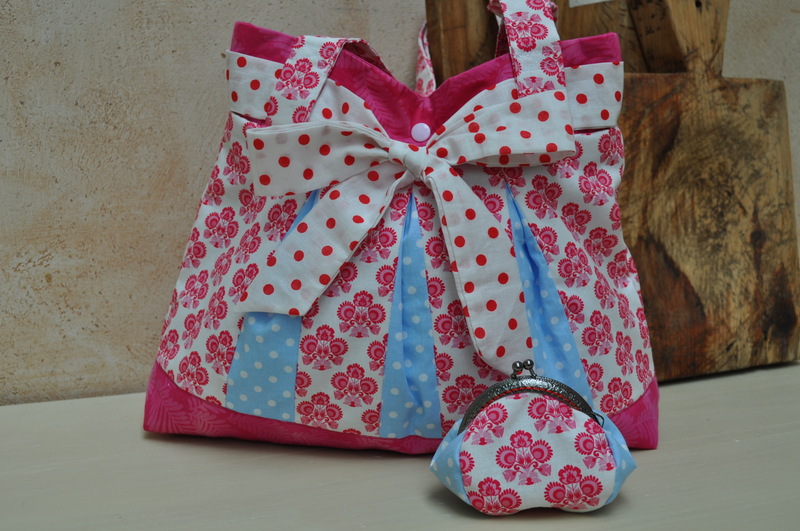 I will be making some more of these – I have had requests – but I think I will add an interior pocket next time otherwise there could be lots of fruitless rummaging going on when looking for mobile phones or car keys. My sewing buddy has put me to shame and finished her ‘handbag quilt’ before me. 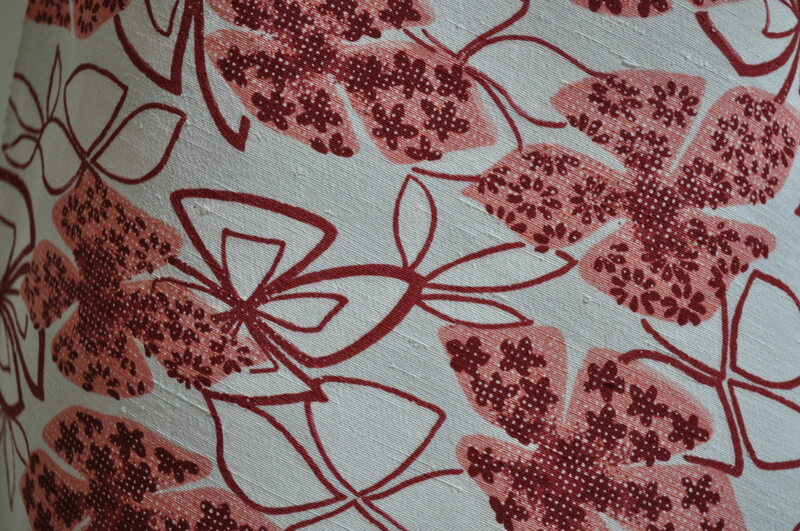 I love all those cottage chic florals and muted colours and I have put it in my shop. I am still quilting mine, which has a completely different feel as it is mostly in black, grey and cream, and will hopefully get it finished once Mlle T. the elder has gone back to Uni and stopped hogging my workroom and no longer needs my (surreptitious) overseeing on her sewing projects. 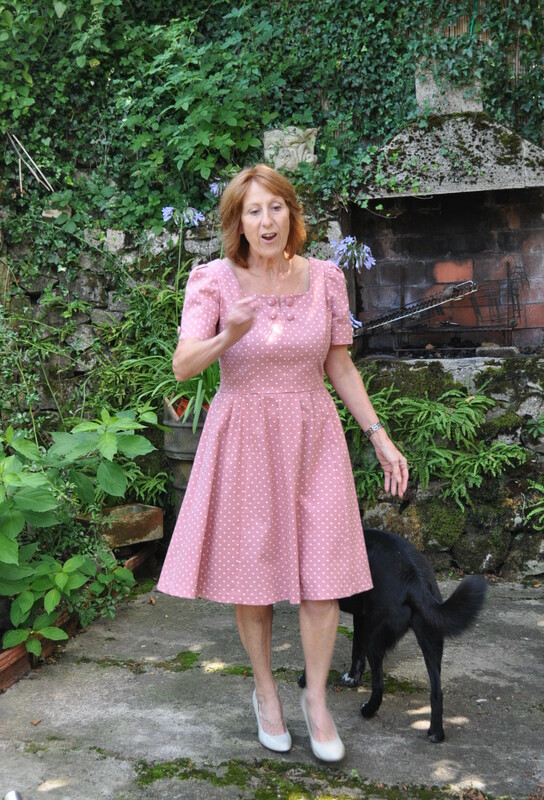 Speaking of which – how proud am I that, as only her 3rd ever project, she made this lovely dress from the Simplicity 1803 pattern. I even forgive her for the fact that I bought the pattern for myself (although was going to do View C with short sleeves and this is View B) and had even bought this same fabric. 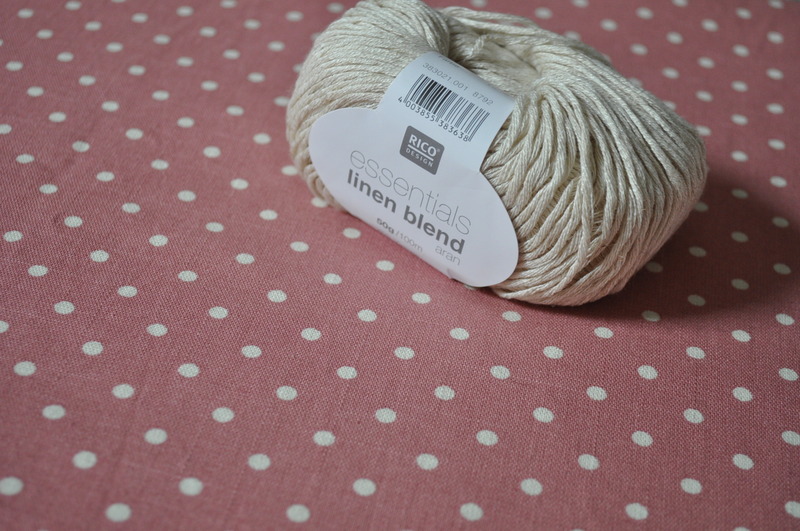 I will still make it but I have some dusty pink linen mix fabric with cream polka dots and will use the white patterned fabric for something else. She did all the shaping, facings, gathering and zip insertion by herself so I am definitely going to get a sewing machine delivered to the U.K. as soon as she goes back as her belated birthday present because I really think she will continue sewing now she has a few successful projects under her belt. This is a lovely pattern – it has a beautiful scooped back – but I do recommend you make a muslin first as the bodice is very fitted and, to be honest, the sizes on the pattern envelope don’t make too much sense. We just made a muslin for the bodice, without facings or anything and it was time well spent as it came up much smaller than we wanted it. 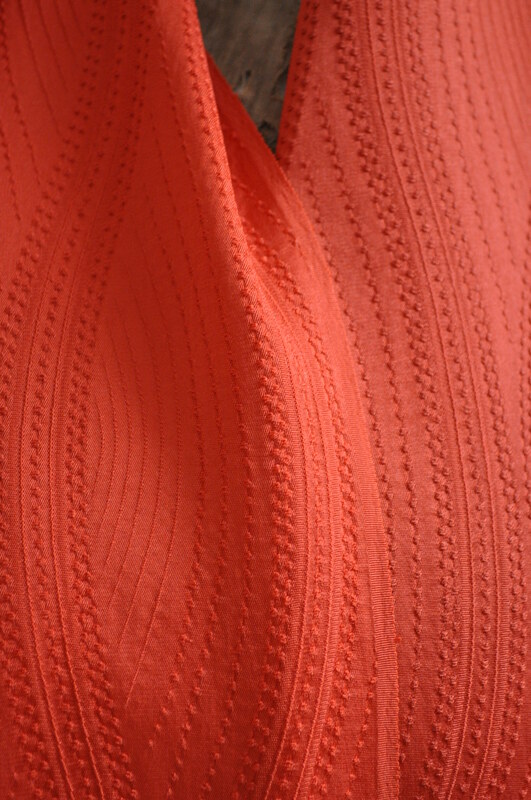 I have seen versions where other people have pleated the skirt a little rather than gathering it, especially if the fabric is a little thick but this one was gathered, as per the pattern, and I think it works well even with this slightly heavy cotton. Stan looks on admiringly and shows off his film star smile. Another two weeks of the summer holidays left so I am making the most of her being here and not moaning about my projects going very slowly or my vintage shop being neglected because, once she returns to Uni, I’ll probably have my workroom to myself until December and I’ll be able to do what I want but it won’t be as much fun! p.s. I do have another Mlle Tialys – and I’m not deliberately leaving her out in my blog posts – but she has as much interest in sewing as I have in Manga or Screamo bands so, until her tastes change or, in a more unlikely scenario, mine do, she will not be found in my workroom unless it is to bring me a cup of tea.